Amir Asgharnejad is a performance artist who released a series of videos several years ago in which he provoked strangers to the point of violence. They became a viral sensation, leading an energy drink company to approach him with a novel marketing campaign that was, like “Springtime for Hitler” in Mel Brooks’ The Producers, specifically designed to fail, thereby generating a ton of publicity. He neglected to tell the company that the videos were all staged, especially since they intended to pay him. Things went disastrously wrong. Asgharnejad’s friend, filmmaker Kristoffer Borgli, wanted to make a movie about these events. The prankster agreed, on the condition that he play himself. The result of all this is Drib, a picture that’s half-documentary, half-dramatization. That set-up is really fascinating. Unfortunately, once you get past it, everything goes downhill quickly. 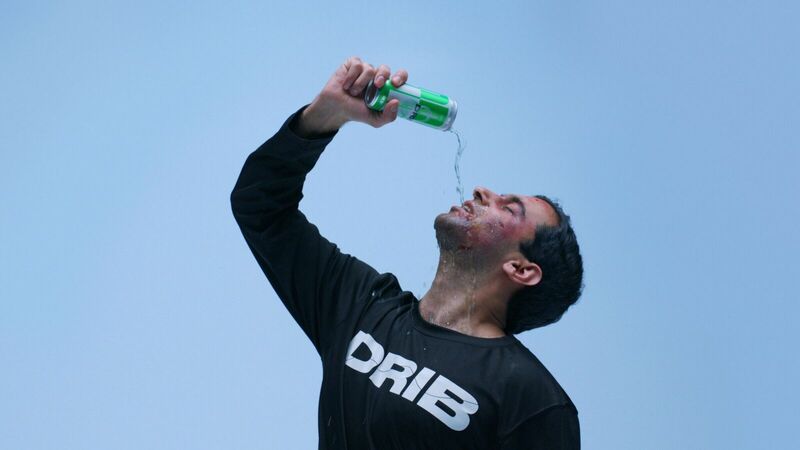 Drib, named for the fictitious company in the story, is an example of the current trend of “anti-comedy” in which laughter is mined through the presentation of absurd things in a manner that intentionally isn’t funny. (Some people get this approach, others do not. I acknowledge mostly being in the latter category.) There are plenty of opportunities for jokes — the way an obnoxious advertising executive (Brett Gerlman) attempts to put the unconventional Amir into a conventional box, the myriad poor ideas that cause the campaign to fall apart, etc. Rather than assembling these things into a humorous cautionary tale about the perils of trying to force something to go viral, Drib plays out as a series of long conversational scenes. Characters talk and talk and talk, oftentimes saying things that are either of little direct connection to the ostensible plot or belabor their point needlessly. That completely robs it of comedic momentum. Of course, the question of whether any of this is true looms over the entire film. That’s another element Drib could have explored in a much more intriguing fashion. Asgharnejad is an avowed prankster. What if none of this really happened? Did Borgli have any doubts about the tale’s veracity, and if so, why not openly grill his subject about them during the documentary moments? Drib is certainly an outside-the-box movie, which means it deserves at least a bit of respect. One can’t shake the feeling, though, that it could have been a really stinging satire about the manipulative nature of modern advertising, rather than just a rambling, unfocused missed opportunity. For more information on the titles screening at this year’s Fantasia International Film Festival, please visit their official website.